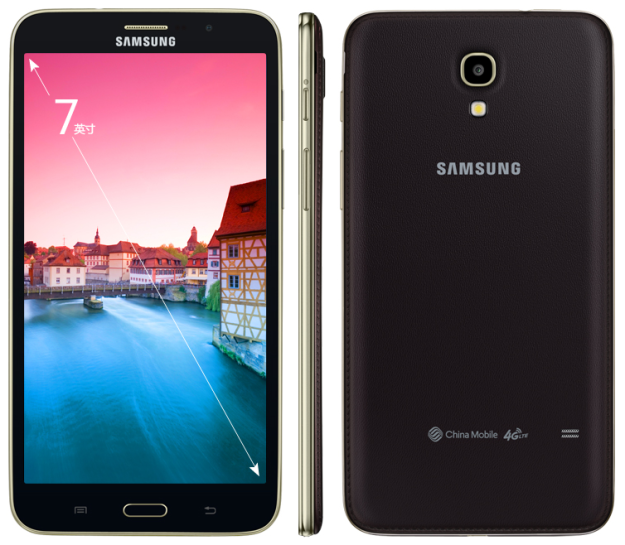 A super-sized 7-inch phablet has been officially launched by Samsung in China. The Galaxy Tab Q (SM-T2558) is the South Korean tech giant's first 7-inch tablet with 4G LTE support. The device was launched in China via a Samsung partnership with China Mobile and China Unicom. These telcos will bundle their high-speed data plans with the phablet, which will support both 4G LTE network data and voice calling. Specs wise, the Galaxy Tab Q consists of a 7-inch 720x1280 pixel display, a quad-core processor clocked at 1.2 GHz, 1.5GB of RAM, a microSD card slot, an 8MP rear camera, a 2MP front shooter, a 3,200mAh battery, USB 2.0 port, Bluetooth 4.0, GPS (with GLONASS) and Wi-Fi 802.11 a/b/g/n connectivity. The device is believed to be running Android 4.3 Jelly Bean, with TouchWiz Nature UX on the top. The Galaxy Tab Q (SM-T2558) comes with a faux leather finish on the back cover, the same as the one found in Galaxy Note 3, it measures 191.8 x 99.7 x 8.9mm and weighs 250g. The Samsung experts at SamMobile suspect that the device will not be reaching markets other than China as it does not incorporate modern features such as a recent apps button or the latest version of Android. It does come pre-installed with apps such as Group Play and S Beam however, with additional proprietary Samsung software features including Multi-Window, Air View and Smart Stay available out of the box. Unfortunately pricing information and availability are yet to be revealed. Would you like to see the Samsung Galaxy Tab Q launch in your country? Please let us know in the comments below. Samsung announces the Tab S5e 10.5-inch tablet Intel patent shows tri-fold mobile device designs Samsung postpones Galaxy Fold consumer launch Has Samsung been chosen for Intel Xe GPU manufacturing? Does the Samsung Galaxy Fold hinge and screen lack durability? Anyone propagating the use of Phablet as a legitimate word should be prevented from breeding. Anyone who buys a phablet probably should too. What constitutes a “phablet” these days? I remember seeing the original Galaxy Note described as a phablet, but it's got a screen that's the same size, or smaller, than many top-end smartphones these days. Oh, and while we're on the “stupid uses of technology” can I add “people who walk around using their tablets as cameras”. Nexus7 and iPadMini are arguable, but I see folks with 9“ and 10” Galaxy Tab's and iPads doing this and it looks utterly ridiculous.